Supply chain management processes have gradually shifted from a supply-driven focus to a demand-driven one in order to better synchronize demand and supply signals. 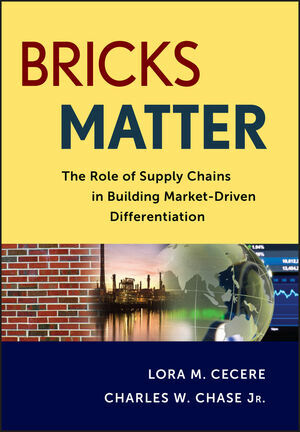 Bricks Matter shows you how you can identify market risks and opportunities and translate these into winning tactics. Business cases highlight how business leaders are winning through market-driven approaches. As companies transition from demand-driven to market-driven approach, the focus in organizations shifts from one of vertical excellence to building strong market-to-market horizontal processes. Improve revenue by increasing market share, improve profit margins, and maintain high levels of customer service with the indispensable guidance found in Bricks Matter. LORA M. CECERE is the founder of the research firm Supply Chain Insights, which is paving new directions in building thought-leading supply chain research. She is also the author of the enterprise software blog "Supply Chain Shaman." The blog focuses on the use of enterprise applications to drive supply chain excellence. As an enterprise strategist, Lora focuses on the changing face of enterprise technologies. With over forty years of diverse supply chain experience, Lora spent nine years as an industry analyst with Gartner Group, AMR Research, Inc., and Altimeter Group. CHARLES W. CHASE Jr. is Chief Industry Consultant and Subject Matter Expert, SAS Institute Inc. He is the primary architect and strategist for delivering demand planning and forecasting solutions to improve supply chain efficiencies for SAS customers. He has more than twenty-six years of experience in the consumer packaged goods industry and is an expert in sales forecasting, market response modeling, econometrics, and supply chain management.